This guide discusses the creation of a Telephone Paging Matrix that can be controlled with any POTS or analog PBX connected to a BSS Audio Soundweb London Telephone Hybrid card. The design contains 32 zones but can easily be scaled up to 64 zones as needed. The audio configuration is very straightforward, and is illustrated at the bottom of this guide. Compressor and Paramatric EQ processing objects are included to tune the microphone for maximum intelligibility, a Delay object is used to trap any handset noise at the end of a page, and a Gain object provides level and mute control. The signal is then fed into a Matrix Router which is controlled via Parameter Presets to route the page to the desired output. A 12-band Parametric Equalizer object is provided for frequency correction on each output and a single Crossover object on each output provides gain and mute points as well as some High Pass and Low Pass filtering commonly required in distributed audio systems. The first action of the circuit is initiated by the Telephone Hybrid card going ‘off-hook’ when automatically answering a call. This pulses a Logic End linked to a mute button on the Tone Generator circuit. This tone provides a prompt for the caller to enter the three digit zone number. This is run through a Logic NOT gate to invert the signal. This also removes the Reset [R] on all the Counter Triggers. 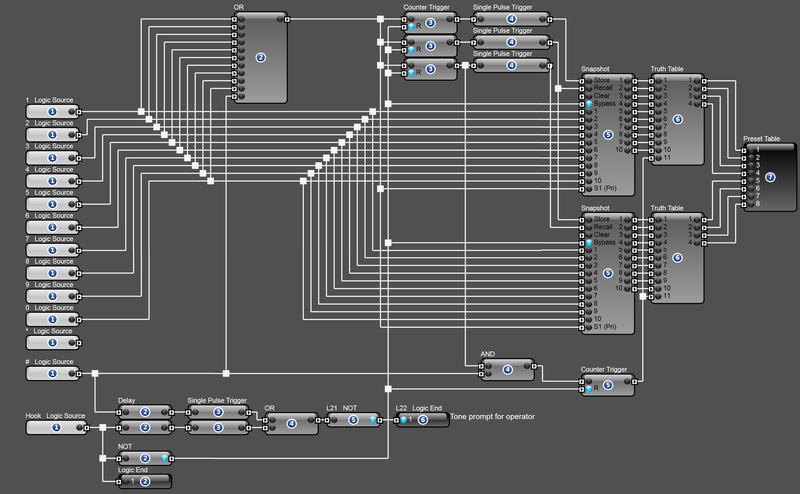 This is done through a Logic Link between the Logic End and the Mute button in the Gain object. After the # key is pressed, another tone prompts the operator to begin their paging message. At the beginning of the circuit are eleven Logic sources. These are linked to the DTMF detect outputs of the Telephone Input Card by dragging from the Venue Explorer window onto the Logic Source object in the Logic Configuration window. The DTMF Detect values are found under the Telephone Input Card section of the Venue Explorer. The next part of the logic circuit is the counter. There are several was to create a count within the Logic configuration, for this example three individual Counter Triggers are the most efficient choice. The Counter Triggers are used to control the Logic Snapshots that are storing the numbers in the order they are pressed. Each Counter has its count property set to its position in the count; the first one is 1, the second is 2 and so on. A Logic OR object sums the outputs of the 0 – 9 and # Logic Sources and is fed to each Counter Trigger. Each time a button is pressed the input on the counters is driven. The outputs from the three counters are used to control the Store [S] and Recall [R] inputs on the two Snapshot objects as the count progresses. The next segment of the Logic circuit is the two digit register. There are two Snapshot objects, one for each digit of the zone number [01 – 32]. The 0 – 9 buttons are bused to both Snapshot objects. As the numerical buttons 0 – 9 are pressed, the corresponding input and the Snapshot Select of both Snapshot objects will change to high. However, only the Snapshot object with its Store input also pulsed high will store the number on its input. On the first press the first Counter pulses the Store input on the first Snapshot. On the second press the second counter pulses the first Snapshot object’s Recall and the second Snapshot object’s Store. The third and final press pulses both Snapshot objects’ Recall. The output of the Snapshot needs to be converted to Binary in order to get the larger numbers we need, and to utilize the Preset Table logic object. To do this we use a simple Truth Table. This is configured as 11 inputs [0 – 9 plus a trigger] and 4 outputs [4 bitword]. Each decimal output of the Snapshot object is converted to a 4 bit word: 1 would be 1000, 5 would be 1010 for example. The # key drives a Counter Trigger that is acting as the trigger input [#11] on the Truth Table. This counter can only be triggered if the # key is pressed and it is the third key pressed. The trigger input on the Truth Table allows the number to be held in both tables until the # key is pressed allowing both Truth Tables to pass their values to the Preset Table at the same time. Without this hold, the router would change as each digit was entered causing an incorrect route until the final digit was pressed. The final segment of this Logic circuit is the Preset Table that changes the microphone router. The order of the words from the Snapshot objects may be connected in a least-significant to most-significant order to make programming the table easier. The last action of the circuit is to reset the router when the Hybrid card goes ‘on-hook’ at the conclusion of the paging message. When the Telephone Hybrid goes ‘on-hook’, all counters reset and the Snapshot objects are bypassed, clearing the router and preparing the Logic circuit for the next paging message.